Say hello to Jocelyn. SHe wears a lot of different hats (and helmets, of course) in the portland cycling community and far beyond. 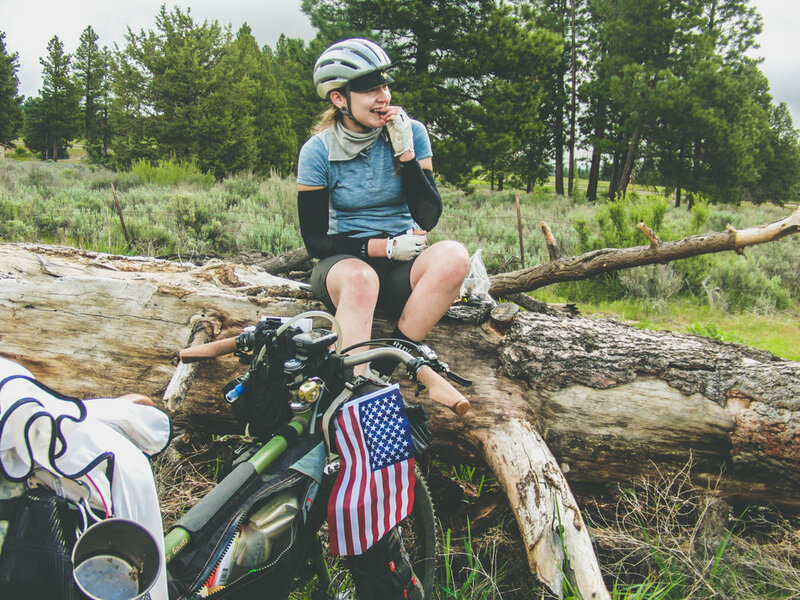 SHe's at the forefront of bikepacking with a major focus on getting women on bikes and out into the woods. MK: Tell us about your first bikepacking trip and what role food played in it? Jocelyn: My first bikepacking trip was in September, 2014. It was a really great overnighter that took us out to The Gorge in Oregon. There were beautiful views of the river and the mountains. We did a simple out and back, and for the whole first day we basically climbed up this giant hill and then we camped at the top. I was on my commuter bike, which is a mixed frame with 650B wheels that are 42mm wide, so it works well for off-road cycling. To carry all my gear, I had a rear rack with panniers that I loaded up. The friends I was riding with made their famous bison chili for dinner that night, which was really special. They were taking me out on my first trip and they handled the food aspect of it, which was really generous and lovely. Then there was a little town that we went through and had lunch on the day we started and also on the way back. The only other aspect that I remember is that I carefully considered my coffee setup. I took my Aero Press with some coffee from a local roaster called Trailhead Coffee Roasters, and it was delicious. I'm a pretty comfortable off-road cyclist, but after that ride, I made a very conscious decision that I love bikepacking and I needed to immediately invest in some gear to make this a little bit more comfortable. 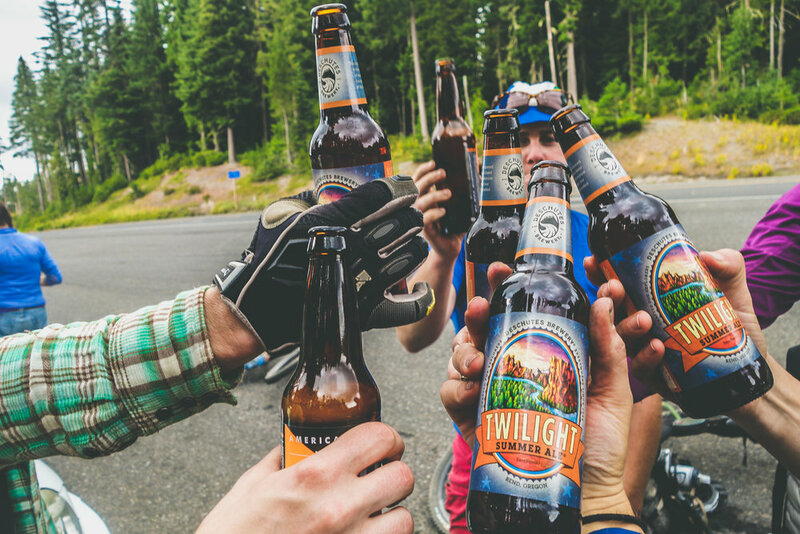 MK: You're at the forefront of bikepacking adventures with a specific focus on getting Women, Trans and Femme cyclists out into the backcountry. With the two groups you started, Komorebi and WTF Bike Explorers, what has your experience been like so far with these groups in the bikepacking community? Jocelyn: Both have been so incredibly welcomed and received by the community. I started Komorebi back in 2015, and I started as an absolute beginner. The whole concept was that we're going to learn together and then we're going to share what we learned. It worked really well for the first year. We organized a trip every single month, and every time we invited two first-timers out to join us. I bestowed information upon them and they continued to learn with each other, so that was a really special experience. I’m a quick learner, especially when it comes to something that I'm really passionate about, so I had a fairly steep learning curve. I still do enjoy taking groups of beginners out, so last year I did my first big beginner clinic series rides with twenty ladies out for their first trip. It's so rewarding to see them settle into it. For a lot of them, it's their first time riding off-road, so it's two pretty significant barriers that they're trying to learn to get over: riding off-road, and dealing with this loaded bike and learning how to you attach all of your various gear to it. But they pick up on it super fast and my job is to make sure that they have as brilliant an experience as possible for the first time. I want them to fall in love with it, and I just want them to keep going and inviting more and more women out to take part. One thing that we did with the beginners last year: I went out there early and I actually pulled a trailer so I could bring in a bunch of firewood and boxed wine and really try and turn it into a bit of a party atmosphere. I co-founded The WTF Bike Explorers with a bunch of other really amazing people. We’re shooting for this big summit in August that's going to have room for 150 cyclists to join us. Then, in the lead up to that, we're going to host rides in a few different places around the country, including Vermont, Connecticut, Arizona, California, and Oregon. We'll meet for a ride in Montana right before the summit as well. MK: Do you teach them a bit about how to pack food on the bike as well? Jocelyn: Definitely. That’s certainly a big aspect in teaching people how to properly take care of themselves in the backcountry. Bikepacking to me is so much about settling into the experience of being able to ride, eat, rest, and repeat. That's why I love it so much: because it simplifies life down into those things. There will be certain occasions when I find myself in a rush to get somewhere, but more often than not, when I'm hungry I stop and when I'm thirsty I rest and drink. I try to convey that same kind of lifestyle to the ladies that I take out with me. Hydration is obviously a super important thing to teach folks as well. How to keep themselves hydrated safely, the best place to store water on the bikes, and then – of course – filtering water. Also, how to find water on the route is important. For example, if you're going to a small town, you can bump into a gas station and fill your bottles there, or look for churches as they often have spigots on the outside for drinking. But often, when you find yourself in the backcountry, away from civilization, you have to figure out how to filter water and where the best places to filter water are. Food-wise, we provide them with ideas for what they should take for breakfast, lunch, and dinner. We ask them what they like to eat for those meals at home and have them just take that, possibly with a few modifications. If it's something as simple as an overnight trip, you don’t have to be worried about going super ultra lightweight. The biggest thing to me, and I made this mistake before, is taking a chance on foods that you aren’t used to. It’s terrible getting out there and cracking that thing open and biting into it and saying, “I can’t eat this!” It’s not a place to experiment. So I learned not to take any risks with the food I eat. Also, try to consider your body and how it reacts to food. I know for myself, I have to have a lot of fresh fruits and vegetables in my diet. 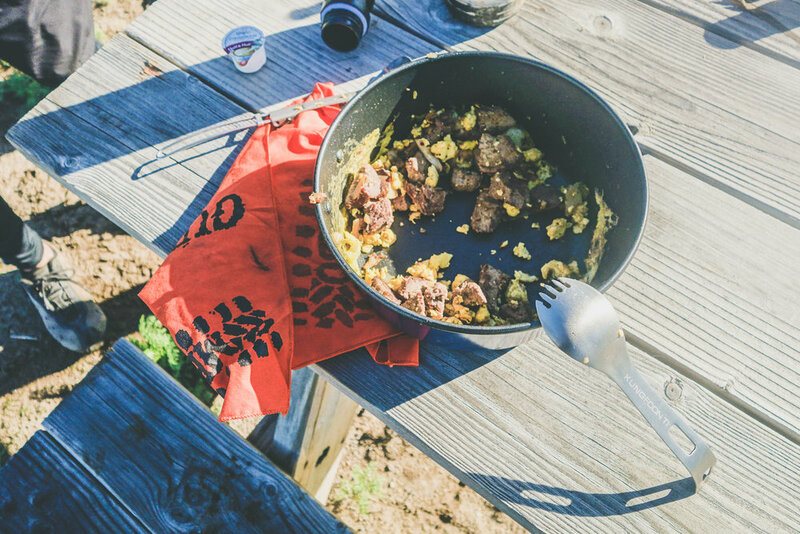 I tried to do rehydrated food packs, and it just does a number on my gut and doesn't make me feel good when I'm in the backcountry, so I stick to real food. One thing I love is the fancy new baby food that you can find now in squeezable pouches and is a mix of fruits and vegetables. I have those things at least once a day on the trail if I can. They're so good and don’t have any added sugar, are full of fiber, and actually taste fresh. MK: Can you tell us about your Baja bikepacking trip and how you prepared for that? Jocelyn: I was invited to join by my friend Molly Sugar, who is a fellow Portlander. She was going down there to ride with two of her friends. They all had ridden the Trans-America trail together a couple years ago. This was kind of like their reunion tour, so I jumped on board. I'm fairly good about trying to do research before I go out there, so I read and reread the route guide that the Baja Divide website provides. They break it up into different tiers, so I was able to just really focus in on the Cape Loop, as that's the part that we rode. The website offers a ton of information about what you're going to find each day in terms of water and food opportunities, but I was really surprised that the Cape Loop ended up being more like a road tour then a bikepack tour, especially once we got to the east side of the peninsula. 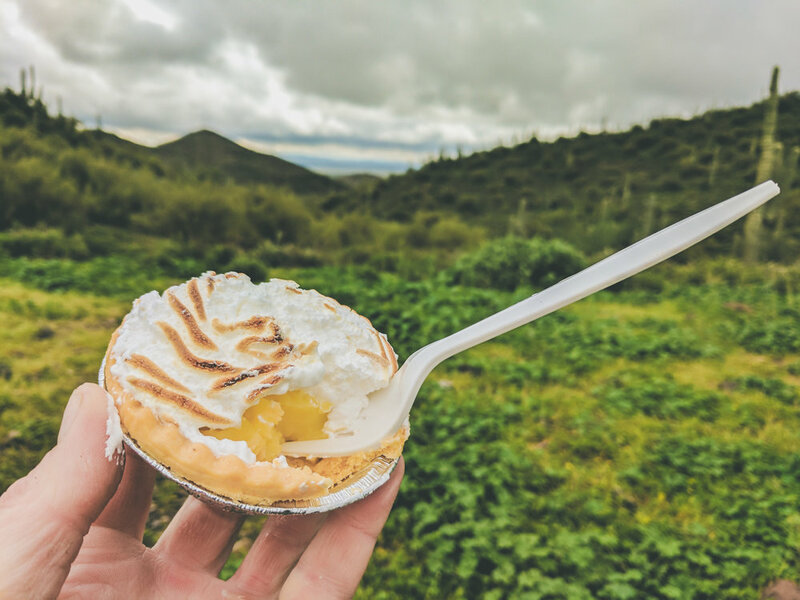 Almost every single day we finished in a town, and that was a good thing: because at the convenience stores, there are plenty of food options and then you start to figure out what you like. By the second half of the trip, there were local restaurants that were serving up delicious meals that were really inexpensive and incredibly delicious. I just settled in on that and I was really grateful that we had the opportunity to visit so many local communities. MK: Could you tell us a bit about the messkit that you brought with you? Jocelyn: As far as my messkit goes, I took a Snowpeak cup and pot that nestles together, and I always pack a cloth napkin in between them so that it doesn't rattle around too much. Then, inside of that, I rest my Esbit stove along with six chunks of the fuel tabs that I could cut down on depending on how much water I needed to boil or what I was cooking. Then I have a spork and a little sponge that I put in there too that helps with clean up. Then my pocket knife that I keep in my fanny pack. I stored everything in an Anything Cage that I had mounted on the fork. For this trip, my messkit was really tight, and I loved how everything fit together really well and was super simple to pack. For food, I ended up bringing just a couple of bars with me to Mexico, because the idea was that we were going to go grocery shopping in San Jose before we left. On top of that, there was going to be plenty of resupply points along the way, so I really didn't bother bringing any food with me all the way from Oregon, which greatly simplified my packing process. The flip side of that was walking into a Mexican grocery store for the first time. I don't speak Spanish, by the way, so it was a bit of a culture shock once I got there. I just took a deep breath and I told myself that it was going to be okay. It doesn't matter if you can't read the label or if you don't know how much something is; you just pick it up and get creative. It was great! I got really excited and spent a bunch of time in the produce section, looking at all the foods that were different from what I'm used to seeing in my grocery store. There were things like jamaica [hibiscus] flowers and star fruit. I never see star fruit in January! It was just so awesome and beautiful. 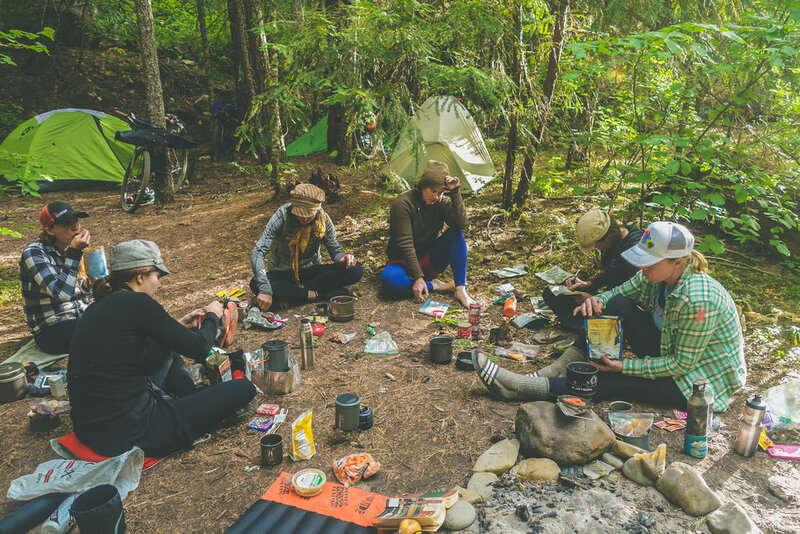 We relied heavily on tuna, bags of prepared beans, and then the saving grace was the tortillas, which were always so delicious and readily available anywhere on the trail. Avocados were always around too, so that was what most lunches and snacks consisted of. MK: Was there a moment that really sticks out in your mind? Jocelyn: The second day of our trip we had expected to make it into Todos Santos by the end of the day, so we expected to have dinner there. But unfortunately, because of mechanical issues, that didn't happen. We found ourselves with just a few bars to share for dinner, and it was pretty nerve-wracking. It really made it clear how I've never had to worry about food my entire life, and this was the first time where I was hungry and I didn't know the next time I was going to eat. We were out in the middle of the desert, and we were facing some serious mechanical issues, still twenty miles from the closest town. But we ended up asking for help and we found ourselves in this teeny tiny little town of about four houses. Another woman in our group was a fluent Spanish speaker, so she walked up to a house to ask for help, and they very generously took us in. We were so utterly exhausted, dirty and smelly, and a little stressed out from dealing with broken bikes all day long. But the family was so excited to have us as guests that they ended up inviting us into their open-air home with a thatched roof. 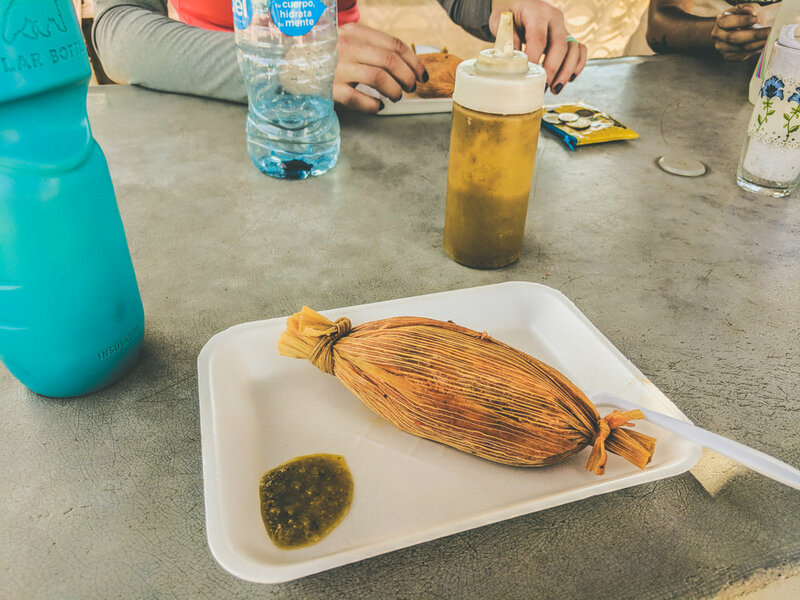 They ended up feeding us a huge bowl of ranch beans, a stack of warm tortillas, and then there was this beautiful cheese loaf, all handmade with fresh-from-the-farm ingredients. It was the most delicious meal of the trip. We were absolutely silent, filling our faces, and the family was just standing around the table, just excited about having guests. That night, we slept in the field beside their house. We woke up the next morning before dawn with the roosters going off. On our way out, they sent us off with freshly picked mandarins. So that was a really cool experience that made the trip feel very special. MK: Can you tell me more about the culinary situation over there? A couple of people who have been on the trail, like Gabriel Amadeus Tiller, posted some amazing Mexican food photos. Jocelyn: It was absolutely incredible. Every single meal in Mexico was outstanding. I never had a meal disappoint me, and I didn't have any stomach problems the entire time I was down there. My favourite meal, other than at the ranch, was a dinner on the east side of the peninsula. There were these empanadas filled with white fish and shrimp that were cooked to perfection with a beautifully-flaky crust. They were served with a super tasty red sauce that had just enough spice, and then slathered with guacamole. Just amazing. We also had really authentic huevos rancheros for breakfast with beans that were made with lard. We had 40 fully-loaded miles to ride that day, so I knew I was going to enjoy every single bite of it. I also had a pozole for my last meal that was just a delicious bowl of broth with fresh chopped minced onion on top. It blew my mind. This was at a deli across the street from the little hotel we were staying at. That's the other thing that I really loved: the little neighbourhood in San Jose where we started and ended up in. It’s not a tourist destination, but it’s a local neighbourhood with family houses and little locally-owned businesses mixed in. It really opens you up to a personal experience staying in a community like that. MK: Aside from the Baja trip, what kind of staples do you usually take with you on a bikepacking trip? Jocelyn: I really like the fancier baby food! It’s one of those things that I’ve got to have. Then there are packets of almond butter or peanut butter. Sometimes I'll go with Trail Butter, which is a locally made product from Portland. It’s a super dense peanut butter that is jam-packed with a bunch of other yummy stuff including caffeine. I like to sneak in an avocado out there, which is usually one of my backpacking treats. A hard block of cheddar cheese is pretty good, and some hummus too. Those things will last for a few days without refrigeration, and it's really nice to have them as sources of protein. I love bagels as well because they're so hearty and they pack easily. You can smash a bagel down into whatever bag and they're not going to get out of shape. For breakfast, I love a bagel with a smear of avocado, a splash of hot sauce, and a sprinkle of salt. I’ll do oatmeal sometimes, but I find I burn through it so fast that I'm usually snacking before I even leave camp. There is a company here called Fish People that do packaged meals like salmon with alfredo sauce that are really delicious, so I'll pack that and have it with a little bag of pasta. Frito pies are one of my guilty pleasures. I only do that if we have the opportunity to recharge at a store. It’s so easy. Basically, it’s just a bag of Fritos with a can of chili and I'm in business! I literally don't even need a bowl or anything. First, you warm up your chili, and then you just pour it into your chip bag and eat it hobo style. MK: What have you learned about yourself on the trips you take? Jocelyn: I’m a really tidy packer and I need my bike to be all locked and loaded before I start pedaling. So I'm very specific about where I pack everything because I appreciate the routine. The first thing I do when I get to camp is I take my helmet off and my beanie gets put on. Then I get out my kitchen things and get my tent set-up. I have also learned that I'm a natural leader. I don’t need to be a leader if somebody else wants to step up, but I don’t mind taking the lead and organizing things. The complementary part of that is that I'm able to stay fairly level-headed and make responsible decisions in stressful or dangerous situations. I feel pretty confident in my ability to do that. I have learned that one of my weaknesses is that I'm not very mechanically minded and I don’t like dealing with bike issues. To avoid that, I regularly take my bike to my local bike shop, which is literally a hundred feet from my front door, so that works out very conveniently. They make sure it's in good working order before I take it out to the middle of nowhere and thrash on it. I've had pretty good luck so far with that. I'm still fairly new to bikepacking. I've only been doing it for three and a half years now, but it's my favourite way to experience the world. After going down to the Baja, I feel like I just want to do this all the time. This is how I want to see the world, and this is how I want to live my life in the world. MK: How do you find the time to wear so many hats and still get out there on your bike? Jocelyn: The cycling projects I work on are sort of like my babies. All the projects that I'm going to develop and raise and then put out into the world are my inspiration. I just hope they live on and do good things for humanity. I think that bikes can save the world if you allow them to. That's what kind of drives me. I'm also a total weekend warrior, so that's how I make a lot of it work. I think that there's so much good to be had in getting out of your routine in the city even for just a single night to give yourself time to hit your reset button and spend time in the woods, smell the fresh air, have a campfire, and listen to the birds. I think it could help a lot for people to just have that one night away. That's totally worth it to me: to get out there and have those experiences. MK: Where is your next adventure taking you? Jocelyn: I’m going to host a three-part series for beginner bikepackers starting in late February and early March, weather permitting. I'm going to take them out to the woods to celebrate spring. That'll be a fun little adventure, but the big adventure that I'm hoping to take on this year is exploring more of the Oregon Timber Trail, and ideally having a bunch of friends join me! MK: Thanks for joining us today! Check out Jocelyn's Baja basic inspired tacos.